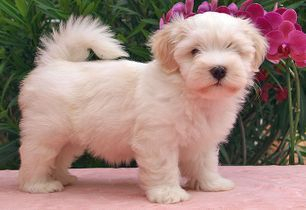 The Bichon Havanese is the National Dog of Cuba. It is a small, friendly dog ideal for families. The Bichon Havanese is a descendent of breeds brought to Cuba from Spain. Once known as the Havana Silk Dog, the Bichon Havanese evolved from its role as a pampered lap-dog into a family companion responsible for being a watchdog, child’s playmate and herder of the family’s poultry flock. The breed almost became extinct after the 1959 Cuban revolution. A few families fled Cuba and came to the U.S. with their Havanese. Most present-day Havanese are descendants of these eleven dogs and some are descendants from dogs that lived in Cuba. 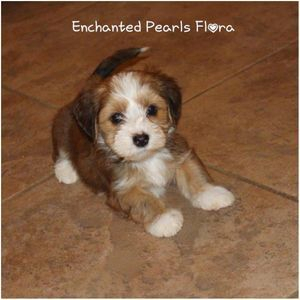 The Havanese was recognized as a breed by the AKC (American Kennel Club) in 1996, and is considered a companion toy dog. Is the Bichon Havanese right for you? The Havanese is easily trainable and intelligent. It has a naturally affectionate temperament, which makes the breed an ideal family pet. If given lots of love and attention this dog is the perfect pet. Although a toy dog, they are energetic and require some form of daily exercise. They enjoy going on walks or running around the yard. The breed’s non-shedding coat makes it suitable for those with allergies, but regular grooming is necessary to keep the coat in good condition. The breeds wavy, silky coat is abundant, but remains extremely light, protecting the breed against harsh tropical heat. Its coat comes in all colors including red, black, white and chocolate. Of course its kept long for shows, but may be cut short on a pet dog for easier care. Bichon Havanese are natural companion dogs: gentle and responsive. They become very attached to their human families and are excellent with children. They are affectionate, playful and extremely intelligence. These happy dogs are very sociable and will get along with everyone including people, dogs, birds and other pets. They are easy to obedience train and love learning new tricks. They love to have something to do and enjoy pleasing you by showing off their skills. Havanese love to observe what is going on and will try to climb onto the back of your couch for the best view. They are sensitive to the tone of one's voice and will not respond well to harsh discipline. Owners need to be calm, yet possess some natural authority. It is not their nature to bark a lot, however they are good watch dogs. They like to alert you when a visitor arrives, but will quickly stop if they see you welcome the guest.